Now more than ever, peaceful demonstrations—especially in the form of student protests—are becoming increasingly important in our society, especially after the most recent presidential election. Student demonstrations, at Millsaps College especially, give students the chance to be heard, even if it’s just on a small campus. Being involved with these protests makes students feel like what they have to say is important, and it matters to more than just the students of the campus: seeing the involvement from faculty and staff, along with the community, gives individuals the comfort that they are not the only ones who care about the issues at hand. I think that student protests, especially at Millsaps, are useful because our college is one of the only Liberal Arts school in the state, and I think a lot of people not only in the state but in the South in general look to us and our reactions to different events that occur. 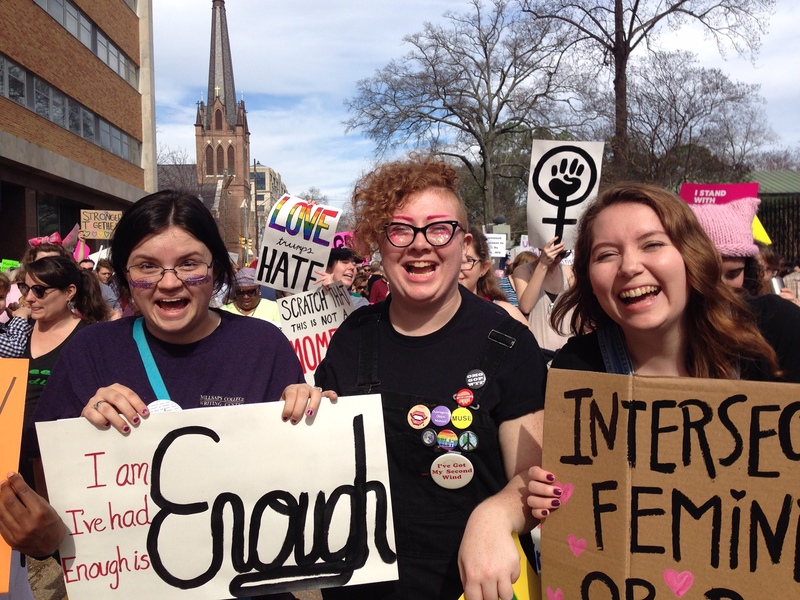 Samesa Hoskins, a junior at Millsaps, put it like this: “As a leading institution, people are watching us to see how we respond to things that happen in the world around us. The state has always been interested in the social and economic justice aspect of Millsaps, which is why we pride ourselves in that anyway. It’s kind of like our duty as a leading institution to respond in some way.” As a student at Millsaps myself, I also believe that the prior statement is true; I personally like to be involved in the political demonstrations happening on this campus because I know that not just the students are watching. These demonstrations hold more ammo than I think we as students believe. For example, the Vigil for Muslims, Refugees, and Immigrants—although less of a protest and more of a supportive and informational demonstration—brought a lot of different members of the Jackson community in general to Millsaps, and even local news stations have covered many of the events that have taken place on this campus. I believe that student demonstrations should happen, because we are the younger generation, which also means that we, obviously, are the future. I think it’s vital for the students to become involved because it shows that these issues in our society today matter to us, and we have these demonstrations because we as individuals are dissatisfied with the world at hand. And if there’s any possibility of changing anything in the future, the youth’s involvement is essential. Just because an issue doesn’t apply to every single one of us as individuals does not mean it does not matter. I think that student demonstrations are the best way to show to everyone that every person matters, especially on this campus. A lot of people may think that some student demonstrations take things too far. In the words of Kaplan, “I think there’s a place for people like me who are just really pissed off and want to yell, and there’s also a very important place for people who want to listen and who want to talk. And I think that maybe we value the wanting to listen people more, but I think that there’s an appropriate time for a lot of things in protests…I think we can’t discredit a protest or a movement just because one guy punched somebody.” Obviously, violence is not the answer, but Kaplan’s right; society should not deem a movement as inferior just because someone got angry at a demonstration. Everyone gets angry sometimes, and in today’s political climate, I can’t say I blame them. Every movement and protest is important, and I think that a lack of understanding the issue at hand causes some to think that a movement might be taking things too far.